A premier goal scorer, Bodine had 82 goals in 2017 and enters her final season at Cherokee with 186 for her career. An All-American last season who also made the all-South Jersey and all-conference first teams, she will play college lacrosse at Butler. South Jersey Magazine: Are you excited for your final season? Gab Bodine: I am. I feel like we have great potential this year. We have a really strong group of seniors and I think we can go pretty far. SJM: Does it feel weird to be a senior? GB: It’s kind of bittersweet. I think I started in seventh grade with these girls, so we’ve been together for a while. It’s definitely going to be sad at the end of the year, but I’m also looking forward to joining a new program at Butler. SJM: Do you have any personal goals this year? GB: I definitely want to reach 200 career goals. I maybe want to break the record for Cherokee, which I think is 218. Melissa Arthur has it; she was actually one of my coaches on my club team. But as long as we win I don’t really care. SJM: What made you pick Butler for college? GB: One of my coaches from the South Jersey Devils started coaching there and she contacted my current coach and said, ‘Gab should get out here to see it.’ So I went out and I loved it. I thought being part of an up-and-coming program would be fun. SJM: Did you get to see the famous Hinkle Fieldhouse, where the movie Hoosiers was filmed? GB: Yes, for my visit we went to a [basketball] game and it was the whiteout game. They blew the other team out, but it was still fun to be in that atmosphere. They told me when I was there, ‘You have to watch Hoosiers,’ so I came home and watched it. GB: I would say my favorite teacher was Ms. [Nicole] Lum; she was my biology teacher. She was one of those teachers who wasn’t too lenient or too strict. She knew how to get you to work and she was fun. SJM: What do you like to do for fun when you’re not playing lacrosse? GB: I know it sounds dorky, but I like to read a lot. I like Stephen King novels. I also watch Netflix a lot—Friends is my favorite, or That ’70s Show. Just little 20-minute episodes that make me laugh. McMonagle has been a top player for the Quakers since he stepped onto the field as a freshman, and last year as a sophomore he was not only the ace pitcher but led the team in hits and Runs batted in. He is also Moorestown’s starting quarterback in football and a key player in basketball, but will focus on baseball at Boston College. South Jersey Magazine: What are your goals this year? Brian McMonagle: Our team goals are to win our division and make a good playoff run, which I believe we’re capable of doing. We have a lot of pitching returning so I think we have a good team. SJM: You threw a no-hitter last year with 13 strikeouts. Did you feel like you had great stuff going into that game? BM: I felt good in my bullpen before the game so I was confident. I was getting through innings quick and I felt like I had command of everything. A buddy of mine came up to me in the fifth inning and asked if I had a perfect game, and the next inning I walked the first batter. But I still got the no-hitter and my fastball was hitting the spot wherever I went with it. … That was my first legitimate no-hitter. SJM: What is a better feeling: throwing a touchdown pass or striking somebody out? BM: That’s tough. The rushes you get in a football game, with the crowd and everything, there’s nothing like it. But the dominance you feel after blowing a fastball by someone is awesome. They’re different and it’s hard to compare, but they’re both great. SJM: Give me your favorite movies for football, basketball and baseball. BM: For football I would say Remember the Titans and Friday Night Lights. Remember the Titans is more of a feel-good movie and Friday Night Lights is just a great movie. For basketball, Hoosiers is probably the only one I’ve seen so I’ll go with that. For baseball, as shocking at it sounds, I haven’t ever seen Bull Durham or Major League or The Natural. I am a big movie person so I would like to see them though. SJM: Do you have a favorite teacher at Moorestown? BM: I would say my history teacher, Mr. [Lorenzo] Eagles. He’s the JV basketball coach and he’s a great guy. He’s a very smart guy, he went to Duke, and he’s just a fun teacher. History is one of my favorite subjects and it’s U.S. history, so it’s fun to learn about politics and everything. SJM: Tell me about your decision to play baseball at Boston College. Was it tough to pick between the sports? BM: I knew coming into high school that I was probably going to try to play baseball in college. BC was the first to offer me and it was a place I always had my mind on. My sister went there so I was fairly familiar with it. I love the coaching staff and what they’re doing there, so it was an easy decision. A starting outfielder since her freshman year—when she helped the Minutemaids win the Group IV state championship—Hoskins is now a senior leader. She is looking to follow up a terrific junior season in which she batted .329 and belted five home runs. South Jersey Magazine: You played a key role on varsity as a freshman and now you’re one of the senior leaders. Are you adjusting to the role? Briana Hoskins: It’s definitely different. There was always someone out there to motivate me, and now I’m the person everybody looks up to. But it’s fun to be on top. I always looked up to [former teammates] Jess Hughes and Lauren Sandelier, and now Lauren is actually my travel coach. They trained me to be a leader and now I’m a captain, so it’s rewarding. SJM: What was it like to contribute to a state championship as a freshman and help the team to a 31-1 record? BH: Nothing will ever beat that season. I thought, ‘Is this what high school softball is really like? Is this normal?’ Then I talked to other friends from Cherokee and Philly and they were like, ‘No, that is not normal.’ So I realized how special it was. SJM: What are your team and individual goals this year? BH: We have eight seniors and our manager is a senior too. Everybody is saying we lost a lot of people, but we’re still solid and we’re trying to keep up the Township name. For myself, my goal is to finally get my 100th hit. I think I’m in the 80s now, so that’s my personal goal. SJM: I know your dad was a longtime basketball coach at Deptford. Did you ever get into the sport? BH: I played basketball my freshman year and then I gave it up to be more focused on softball. I missed a lot of travel softball for basketball and I didn’t want to do that anymore. My brother is the basketball player in the family. SJM: Did having a coach in the family influence you as an athlete? BH: For sure. He was my coach for a while. … My dad had a huge impact and he’s always at every game. He stopped coaching at Deptford to watch me play and that meant a lot. It’s just different when your parents are there to watch you play. SJM: What do you like to do when you’re not playing softball? BH: Last summer I went boating a lot because my boyfriend has a boat. So we went fishing a lot and we went to concerts at the BB&T. You can go in the [river] right next to BB&T and hear the concerts, and that was a lot of fun. I like to go to amusement parks like Six Flags and Busch Gardens. And I also have a job at Friendly’s. SJM: Any favorite movies or TV shows? BH: Grey’s Anatomy is my favorite TV show right now. I’ve already watched them all and now I’m rewatching them. I take AP anatomy so I thought it would help, but it really didn’t. But I know what they’re talking about now on the show. A senior pitcher, Waro has been Eastern’s ace since her sophomore season, when she helped lead the Vikings to the sectional final. She has made the all-South Jersey and all-conference teams each of the last two years. South Jersey Magazine: What can you accomplish this year as a team? Rachel Waro: I think we have so much potential. We had amazing chemistry my sophomore year, and we had some last year too but we were definitely building with new people who were getting comfortable. So that’s one goal, and I think we have a great program with great coaches and great athletes, so we always have a shot at the conference. I’ve been in the playoffs every year I’ve played varsity and I’d love to be in the playoffs again. Last year we drew a tough game against Washington Township, but I think we can go far and I’d love to get past the first couple of rounds. SJM: Two years ago you pitched all 13 innings in a classic sectional final against Egg Harbor Township. What are your memories from that day? RW: That game was crazy and I’m so lucky I got to be a part of that. That was the longest game I’ve ever played in and the longest I’ve ever pitched consecutively, not counting tournaments. I grew up playing with the girls on that team, and the girls we were playing against, some of them had been on my travel teams. It was also my last time playing with my sister Sarah. SJM: Are you looking to play softball in college? RW: I was looking to play for a long time and I was recruited for a long time. But I’m actu- ally not going to play in college, mainly because I’m going to major in accounting and either minor or double major in finance to hopefully get a CPA certification. I’m looking to do it in four instead of five years, which means every break I’m going to be taking courses. I looked at different schedules and the schools that were recruiting me are always traveling at those times. Those are times that I need to be in the classroom to get 150 credits in four years. So unfortunately I won’t be playing, but I still have coaches emailing me in case I change my mind. SJM: When you’re not playing softball or studying, what are some of your hobbies? RW: My No. 1 hobby is probably traveling; not only to get away and see different parts of the world, but because I have a very diverse background. My mom is Irish, German and Danish and my dad is Pacific Islander: Hawaiian and Japanese. So I like learning about different cultures and getting to see what’s out there. Another one of my passions is photography and I’ve been part of Yearbook Club for three years. Community service is also important to me. I’ve been an officer in our Interact Club for three years and we just had an event for senior citizens. I think it opens your eyes to different people out there and gives you a better understanding of the problems people have. SJM: What are some of your favorite places you’ve traveled to? RW: My dad was born in Hawaii in Oahu, so we have family there. That’s one of my favorites because I only get to see them once a year. … The sites are truly breathtaking and I’ve gotten to try things like zip lining that you don’t get to try on a normal basis. An all-South Jersey defender, Funk was set for a big final campaign at Shawnee before undergoing season-ending hip surgery. He was still elected captain and is helping the team in any way possible before continuing his career at Penn State. 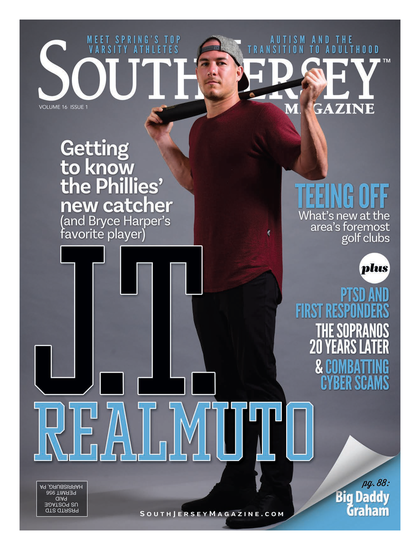 South Jersey Magazine: Obviously it’s disappointing not to be able to play your final season at Shawnee. How are you mentally dealing with it? Brett Funk: I was really sad about it [at first]. I’ve been playing varsity every year and I was look- ing forward to my last go with the kids I’ve been playing with since fourth grade. I was devastated, but I’m trying to keep a positive outlook through it. When we were in New York we walked past Memorial Sloan Kettering Cancer Center; and I have a classmate who has been battling cancer for years. He’s doing alright now, but you realize you have to keep a positive outlook. SJM: At least you will be healthy for when you get to college. What made you commit to Penn State? BF: I’ve been a fan since I was little. My grandmother lives up there and my dad is the only one from his family not to go to Penn State. When I got the offer I just knew it was the place I wanted to be. That was the place I saw my first lacrosse game so it’s a dream come true. BF: We love going to the beach. You’re just in the middle of everything—you can go to Philly for sports games, you can go to the beach, there’s good pizza. I like pizza from La Bella or The Riv, Medford’s two big spots. SJM: Speaking of Philadelphia sports, how did you enjoy the Super Bowl? BF: I was at my friend Ethan Rieger’s; a bunch of the lacrosse guys went over there. I couldn’t go to the parade because I was still on crutches, but I watched it on TV. But the night they won was a fun night. A bunch of us went down to Main Street in Medford. It’s a quiet [area] but there were probably 60 kids out there celebrating. SJM: What do you do for fun when you’re not playing sports? BF: I like surfing, I like going to the beach. I love working out, although it sounds weird to say that. I love hanging with my family and friends and playing with my dog. He’s a labradoodle named Barkley, after [Penn State football star] Saquon Barkley. Last year as a freshman, Oberholtzer became the third member of his family—following older brothers Max and Sam—to play first singles for one of the premier programs in South Jersey. He won 23 matches, claimed the Colonial Conference title and helped the Bulldawgs capture their 15th straight sectional title. South Jersey Magazine: What are your personal goals for this season? Will Oberholtzer: Last year I did not make the state singles tournament and that’s definitely something I’m looking to do. I made it pretty far in the South Jersey tournament and I’m looking to go pretty far in that and play well the whole time. I’d like to win [Camden County and Colonial Conference titles] too. I won the conference tournament and lost the county last year, so it would be nice to get the county too. SJM: Did you grow up in the program since your two older brothers also played at Haddonfield? WO: Yeah, I remember going down to the matches when my brother Sam was a freshman. I don’t even know how long ago that was, maybe fifth grade. It was fun seeing the team and knowing I would be there some day, and I got to meet Mr. [Jeff] Holman. He pretty much is South Jersey tennis. He runs everything from the banquet to all of the tournaments. SJM: Do you have any favorite professional players? WO: I like to watch men’s and women’s tennis. As far as my favorites, I would have to say Jo-Wilfried Tsonga. Casual people may not have heard of him, but he actually gave me his autograph after a match he lost at the U.S. Open and that’s pretty rare. You have to like [Roger] Federer too. He plays with so much class and it’s nice to see him compete at an older age. SJM: Do you go to the U.S. Open a lot? WO: I go every year with my family. We only go up one day but it’s fun. It’s one of the best days of the year. SJM: What other Grand Slam would you like to go to? WO: I would have to rule out the U.S. Open since I’ve been there a lot. I’d probably say the same thing about Wimbledon since I’ve been there, although I would love to go again. So I would say the French Open. We were actually at the courts during the time of the tournament but we didn’t have a ticket, so we couldn’t go in. That’s a legendary tournament too and it would be an honor to see it. SJM: What was the experience like at Wimbledon? WO: It was surreal. You see it on TV and hear about it. All the white clothes and the grass courts and everything that comes with it, it’s just great to see in real life. It should be on anyone’s [bucket list], whether they’re tennis fans or not. WO: You can walk anywhere and downtown is a nice area. You never have to take a car anywhere and we don’t have [school] buses. I don’t even own a bike because you can walk everywhere. It’s very easy to access stuff and there are good restaurants. It just has a nice feel to it. In her first season of high school track last year as a sophomore, Drayton helped three Cougars relays break school records and earned MVP honors for the team. The sprinter took second at sectionals in the 100 meters and capped the year with a ninth-place finish in the 200 at the Meet of Champions. South Jersey Magazine: Last year was a breakout season for you in track. Are you excited to see how you can follow it up? Maya Drayton: Yes, because last year was my first year. I didn’t do track freshman year or in seventh or eighth grade either. I did it when I was younger but I never liked it. I tried it again sophomore year and I actually liked it. I always knew I could run, but I did a lot better than I thought I would. SJM: What are your goals this year? Do you think you can become a sectional or state champion? MD: I’m hoping to be. This is my first year running the [400 meters] and I’m hoping for big things with that. I have time goals for the 100 and 200 too. SJM: What is your favorite subject in school? MD: I’m good at math and chemistry. I’m actually doing well in all of my classes right now. I’m also interested in business. SJM: Any favorite TV shows or movies? MD: I like How to Get Away With Murder and Criminal Minds. My favorite movies are Remember the Titans, Pride and The Blind Side—I like sports movies. Another one of my favorite shows is Last Chance Uon Netflix. It’s a football documentary about a JUCO team. SJM: You are very active in the community as a member of the teen advisory council for the Ronald McDonald House and as a volunteer for the Weisman Children’s Rehabilitation Hospital. Tell me about your experiences with those groups. MD: I first got involved through my cousin and we basically raise money for the Ronald McDonald House in Camden. At Weisman, I greet the families and go in the playroom and play with the kids. … We also took the basketball team to the Ronald McDonald House and prepared a meal for about 50 people on Super Bowl Sunday. We made dips and hoagies, wings and chicken fingers and stuff like that. Nick Decker, Seneca, senior: An outfielder/pitcher, Decker batted .381 last year and was recently named a Rawlings-Perfect Game Preseason All-American. He is committed to Maryland. Jack Herman, Eastern, senior: A fouryear starter in the outfield, Herman is one of the most talented players in the state. He is committed to Maryland but is also expected to be chosen in June’s MLB Draft. Matt Orlando, Bishop Eustace, junior: Yet another local player headed to Maryland, Orlando is a leader on the mound and at the plate for the Crusaders. He went 6-1 as a pitcher and led the team with a .519 batting average. Jake Topolski, Lenape, senior: Topolski, who will continue his career at Duke, is an excellent fielder at second base and hit .414 with three home runs last year. Colin Wetterau, Shawnee, senior: A terrific defensive catcher and leadoff hitter, Wetterau is committed to St. John’s along with Renegade teammate Brian Hendry, a senior pitcher. Danielle Dominik, Kingsway, senior: Dominik, a Monmouth commit, belted a school-record 11 home runs last year and hit .475. She will take over as the ace pitcher this year following a season-ending injury to her close friend, Grace Fagan. Raelyn D’Onofrio, Eastern, junior: One of the best defensive catchers in the area, D’Onofrio threw out seven attempted base stealers last year and batted .400. Elaina Hansen, Clearview, senior: The Pioneers’ career leader in home runs, Hansen is one of the premier power hitters in South Jersey. Karly Messina, Cherokee, sophomore: Messina shined last year as a rookie pitcher, posting a 10-2 record and 2.55 ERA for the Olympic Conference American Division champs. Aiden Blake, Haddonfield, junior: Blake, who has committed to Cornell, led Haddonfield with 44 goals and 32 assists as a sophomore. Zach Cole, Lenape, senior: A midfielder who will play college lacrosse at St. Joseph’s, Cole led the state with 281 ground balls last year and is a dominant faceoff specialist. Judah Hicks, Moorestown, senior: An outstanding defensive player, Hicks helped Moorestown win the Group III state title last year and is committed to Lehigh. Joel Scerbo, Kingsway, senior: A key player for the Dragons since his freshman year, Scerbo enters his final campaign with 116 goals and 51 assists in his career and is headed to High Point. Wayden Ay, Haddonfield, junior: An important player at both ends of the field, Ay had 36 goals and 27 assists last year as the Bulldawgs won their first sectional crown. She is committed to Georgetown. Deanna Balsama, Washington Township, senior: Balsama found the net 59 times last year and is expecting another big season before moving on to George Mason. Kara Heck, Eastern, sophomore: Also a standout field hockey player, Heck recorded 56 goals and 27 assists as a freshman to help Eastern claim its first sectional championship. Robin Panzarella, Moorestown, senior: Panzarella, a midfielder, earned All-American accolades last year after posting 50 goals and 17 assists. She is headed to Penn. Akshay Bhalodia, Moorestown, senior: Bhalodia made it to the South J ersey semifinals, reached the round of 32 at the state tournament and helped the Quakers win a sectional title in 2017. Jack Lavin, Lenape, senior: A fouryear starter at first singles, Lavin made the finals in South Jersey and Burlington County last year and reached the round of 16 at the state tournament. Adam Yu, Cherry Hill East, junior: After playing second singles and reaching the South Jersey quarterfinals last year, Yu is poised to move into the top spot for the Cougars. Doug Ergood, Lenape, senior: Ergood won a pair of tournaments last year, including the Burlington County Open, and also took second at sectionals and fourth at states in Group IV. He is committed to North Carolina. Akhil Giri, Moorestown, junior: Giri’s memorable sophomore season inc luded a tie for second at sectionals and a third-place finish at states in Group III. Therea Luu, Clearview, senior: One of the top female golfers in the state, Luu won three tournaments and took second in two others in 2017. Alec Ryden, Moorestown Friends, junior: A Friends School League allstar each of his first two seasons, Ryden tied for third at the Carl Arena Tournament last year. Khaliel Burnett, Delsea, senior: Last year’s Meet of Champions winner in the triple jump, Burnett was also the Group III state champ. Kervens Mezilus, Cherry Hill East, senior: Mezilus clocked his best time ever—53.28 seconds—to take third in the 400 hurdles at last year’s Meet of Champions. He also took second at sectionals and sixth at states in the event. Antonio Tarantino, Paul VI, senior: A Rutgers commit, Tarantino ran the 200 in 21.21 seconds last year, the sixth-fastest time in state history. He won sectional and state crowns and placed third at the Meet of Champions. Jewel Ash, Eastern, sophomore: As a freshman, Ash was the sectional champion in the 400 meters and 400 hurdles and took second in the 100 hurdles. She competed at states in all three events and went on to place eighth in the 400 hurdles at the Meet of Champions. Shakira Dancy, Winslow, senior: Dancy rolled to her second Meet of Champions title in the 200 meters last year and added a second-place finish in the 100. 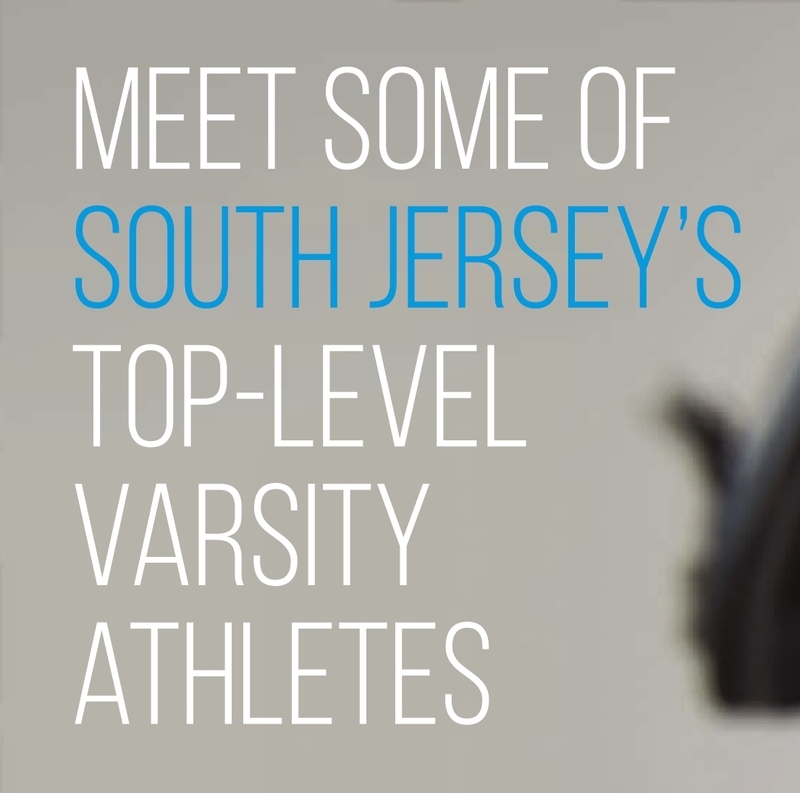 She leads an outstanding group of sprinters in South Jersey. Shelby Whetstone, Lenape, junior: Whetstone set a school record with a time of 55.67 seconds in the 400 to win the Group IV state title last year. She also ran the anchor on the 4x400 relay that placed ninth at the Meet of Champions. Matt Brien, Washington Township, senior: Brien, a setter, recorded 562 assists last season, ranking him in the top 20 in the state. Jake Martin, Kingsway, senior: An outside hitter, Martin set a school record with 364 kills last year on his way to all-state third-team honors.